Part of the excitement of your relocation to London is the chance to experience a completely new culture. Many people who are planning their relocation to London from an English speaking country assume that “it will be the same”. It’s similar but definitely not the same. Even the English language is different. Settling in to your new home and new city is as much a part of your international relocation as any other aspect. One of the best ways to explore a new city is through its cuisine. Fine dining in itself is of a similar standard across the world. 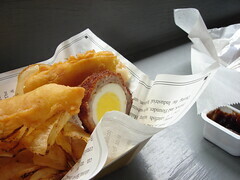 To really experience the city after your relocation to London you need to see what real Londoners are eating. It is hard to try and quantify what traditional British cuisine is because many people in the UK prefer to eat food from other countries. It is a standard joke that the national dish of England is now the Indian curry! One of the traditional dishes in England, and an extremely popular take away item is Fish and Chips. It is considered a cheaper alternative to many other take aways, but there is nothing like a traditional piece of battered fish and chips with oil and vinegar. Don’t even consider thinking about your diet if you’re going to get Fish and Chips as a meal, although you can ask for a ‘lite’ version if you prefer at many of the London ‘chippy’s’. “The Rock and Sole Plaice” has the honor of being the oldest fish and chip shop. The fare is served in the traditional way: wrapped in newspaper and has become a popular tourist spot. The restaurant is close to the theaters of the West End and is popular before and after the shows. The pavement and outside eating area is strung with lights and the décor of the restaurant is distinctly theatrical. It’s a great place to start your hunt for the quintessential Fish and Chip experience. After you’re relocation to London you’ll soon learn that there is o point in asking anyone about their favorite fish and chip shop in London. You’ll get as many different answers as you ask question. Only one thing to do…get out there and choose your own favorite.